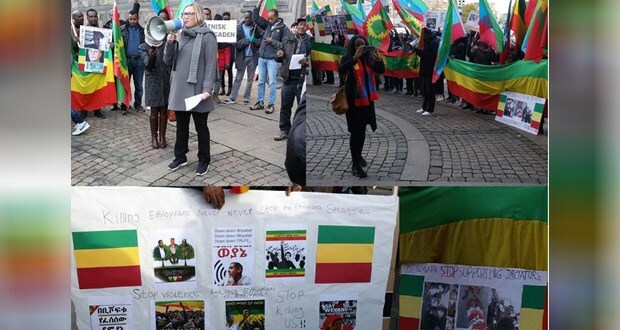 Anti-TPLF demonstration was held in Copenhagen, Denmark on 3. November 2016. Oromo, Ogaden and other members of the Ethiopian community stood together and united to denounce the TPLF-led Ethiopian regime’s massive human rights violations in Ethiopia, and demanded the Danish government and the EU to stand at the side of the people in Ethiopia. A Danish parliamentarian, Eva Flyvholm had made a speech at the rally and expressed her solidarity with the people in Ethiopia. She pointed out that Ethiopia is a beautiful and diverse country with various languages and cultures, but it has been ruled by a brutal and authoritarian regime that imprisons journalists and oppositions, and shoots at peaceful demonstrators. Eva mentioned her concern regarding the misguided policy of Denmark and the EU to rely on the Ethiopian regime to solve the refugee crisis in Europe, but in reality the Ethiopian regime has been one of the major sources of the problem. Many flee Ethiopia because of massive human rights violations in Ethiopia, and many have lost their lives crossing the Mediterranean Sea to reach Europe in order to get security. Therefore, the Danish parliamentarian stressed that Denmark should play a role at the UN and the EU to put pressure on the Ethiopia regime to respect human rights in Ethiopia. Eva promised also that as a member of the Danish parliament, she and her party will continue to support the struggle for human rights, democracy, equality and justice in Ethiopia. The demonstrators chanted slogans, such as Down Down TPLF. Down Down Woyane. There is no democracy, justice and freedom in Ethiopia. We need democracy, justice and equality. TPLF is a killer. TPLF is a mass murderer. Stop killing the Ethiopian people.